1. Ciareteun inscription which was discovered on the side of river Ciareteun, a tributary of the river Cisadane at Ciampea, Bogor. The inscription was written on a large stone using Pallava scripts and Sanskrit language. 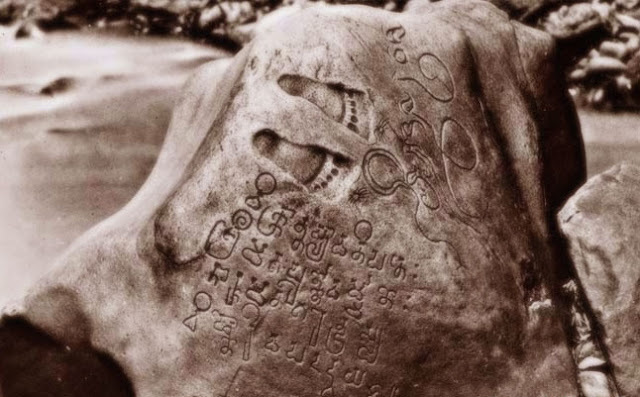 What interested scientists was the existence of a painting and footprints carved on the scripts. "These two footprints, which look like the footprints of Deva Vishnu, are the footprints of His Excellency Purnawar-man, the king of Taruma, the strong and courageous king in the world." 2. 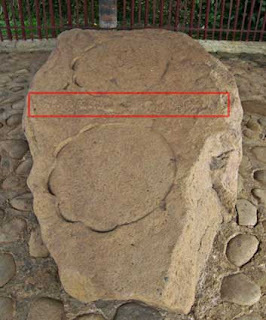 Pasir Koleangkak inscription, which is located in a guava plantation, approximately 30 km to the west of Bogor. "Strong, amazing and honest to his duties was the extraordinary leader of mankind, the famous Sri Purnawarman who once ruled Taruma and whose well-known coat of mail (warman) was impenetrable to enemy weapons. These are a pair of his footprints, he who always attacked enemy towns, respected the princes but was a thorn in the flesh to his enemies." "Here are a pair of elephant footprints ... which look like Airwata, the ruling elephant of Taruma that is great in ... and (?) glory." 4. Tugu inscription, which was discovered at Tugu, Jakarta is the longest inscription inherited by KIng Purnawarman. "In the past a stream (called) - Candrabhaga had been dug by the noble king who had strong, muscular arms, to conduct it to the sea after (this stream) reaches the famous palace. In the twenty-second year of King Purnawarman's reign who was shining with intellectuality and wisdom and who was the pennant of all kings (so now) he ordered to dig a stream was beautiful and had clear water, called Gomati, after the stream bisected the land that was the residence of the Priest, the grandmother (of Purnawarman). This work started on a good day, the 9th of Phalguna and ended on the 13th of Caltra, so it was done in 21 days only, whereas the stream dug was 6,122 'tumbak'. A ceremonial meal was held by the Brahmanas with a gift of 1,000 cows." "This is a (token of) real bravery, greatness and courage of the world king. His Excellency Purnawarman, the pennant of all kings." According to the analysis of Prof. Poerbatjaraka, the center of Tarumanegara kingdom was located in today's Bekasi. 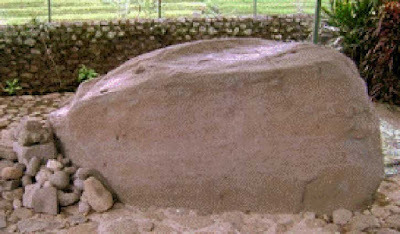 This is based on Tugu inscription which mentions the stream of Candrabhaga that was dug in Tarumanegara. According to the M-D (modifier-noun) rule of noun phrase formation, Candra modifies bhaga like in the word 'perdana menteri' (prime minister) where 'perdana' modifies or explains 'menteri'. According to the M-D rule, the word Candrabhaga should be written bhagachandra (Candra = month). The word Bhagacandra might have changed to Bhagasasi (bhaga month). The Bhagasasi dinally changed is sound into Bhagast which then became Bekasi. 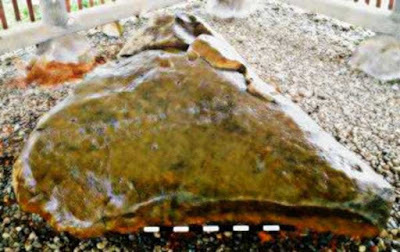 Because of the findings of Tugu and Lebak inscription in the area of Jakarta, it can be assumed that the territory of Tarumanegara kingdom comprised Bogor, Jakarta, and Banten. In the inscriptions, King Purnawarman was praised as a courageous and powerful king surpassing other kings, so he was referred to as the penant of kings. According on Tugu inscription, Purnawarman's father held a position as the king of kings who had dug Candrabhaga canal, whereas Purnawarman himself dug Gomati canal. 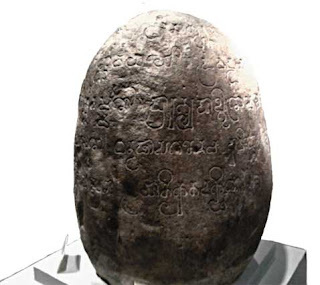 On Jambu inscription, Purnawarman was equalized to Deva Indra who was not only known as the god of war, but also a deva possessing the characteristics of the god of the sun. It was also mentioned that Purnawarman wore a coat of mail (warman). According to Indian stories, the deva who wore coat of mail was only Deva Surya. According to the note of a Buddhist monk from China, Fa-hien, there were only a few Buddhist people found in Tarumanegara in the 5th century AD, but there were quite many Brahmanas and people with poor religions belief. Scientists assumed that the poor belief mentioned by Fa-hien was the religio of Tarumanegara people. Since the religion had different ceremonies from the two religions that Fa-hien knew - Buddhism and Hinduism - Fa-hien called it a poor religion out of ignorance. The religion was the original belief of Indonesian people which was still professed by most people of Tarumanegara. There were two large groups of people in Tarumanegara, people with Hindu culture and people with native culture. Since the development of Hinduism was still in the initial period, it could be assumed that the people with Hindu culture were still confined to the royal families, whereas the second group made up the majority of Tarumanegara people. However, the two groups did not appose each other in everyday life, they even cooperated in some matters. A small number of the first groups consisted of Brahmanas who conducted and controlled Hindu religious ceremonies. They also mastered Sanskrit language which was a language of the religions, whereas those who were not brahmanas used another language which was called kun-lun by the Chinese. The language was the stem of Malay (Indonesian) which mixed with Sanskrit and was used in both Java and Sumatera. According to news from China, Tarumanegara merchants traded turtle hide, rhinoceros horn, ivory, and silver. If the news was correct, it can be concluded that the livelihoods of Tarumanegara people consisted of hunting, mining, fishery, and agriculture. The trading of rhinoceros hirns and ivory indicated that the goods were the results of hunting. Since rhinoceroses and elephants are wild and dangerous animals. Tarumanegara's hunters must be skillful and brave. The existence of fishery was concluded from the trade of turtle hide which was demanded in large quantities by Chinese merchants. Mining was associated with the trade of gold and silver. Agriculture was concluded from Tugu inscription which told about the digging of Candrabhaga and Gomati canals which were completed between Phalguna and Caitra months that coincided with February abd April. In West Java, especially in Bogor area, January and February were the months in which the rainfall was high. It could be assumed then that the digging of the canals was done to evercome floods that damaged farmlands. News from China mentioned that Tarumanegara people ate with their hands, they not use chopsticks. It could be concluded that Tarumanegara people used to eat rice as their staple food. Therefore, the crop they grew was most probably rice. News China stated that in 528 and 535 AD, there were messengers from To-lo-mo in the south to China. The same thing happened in 666 and 669 AD. It could be assumed based on the news that Tarumanegara still existed in the 7th century abd was still active in trading with China. But after the 7th century, there were no more such messengers. This was probably because the coasts of Tarumanegara were attacked and taken over by Sriwijaya. The capital of Tarumanegara was then moved farther inland, and it did not develop relations with foreign countries any more.